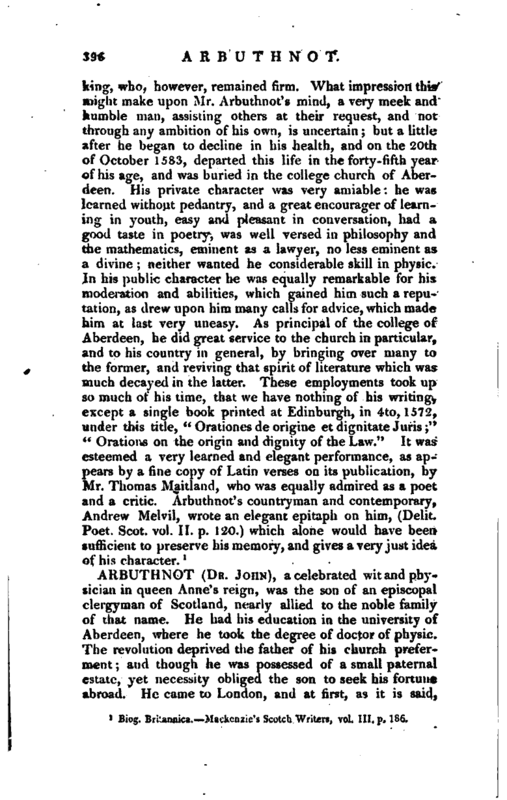 , principal of the university of Aberdeen, was the son of the baron of Arbuthnot, and was born in the year 1538. He studied philosophy and the classics in the university of Aberdeen, and civil law in France, where he was five years under the care of the famous Cujacius. Having taken the degree of licentiate, he returned home in 1563, and appeared very warmly in support of the reformed religion. At this time queen Mary was resident in her kingdom; but the earl of Murray having the supreme direction of all things, the reformed church of Scotland was in a very flourishing condition. The friends of Mr. Arbuthnot prevailed upon him to take orders, but whether he received them from a bishop or from presbyters is uncertain. 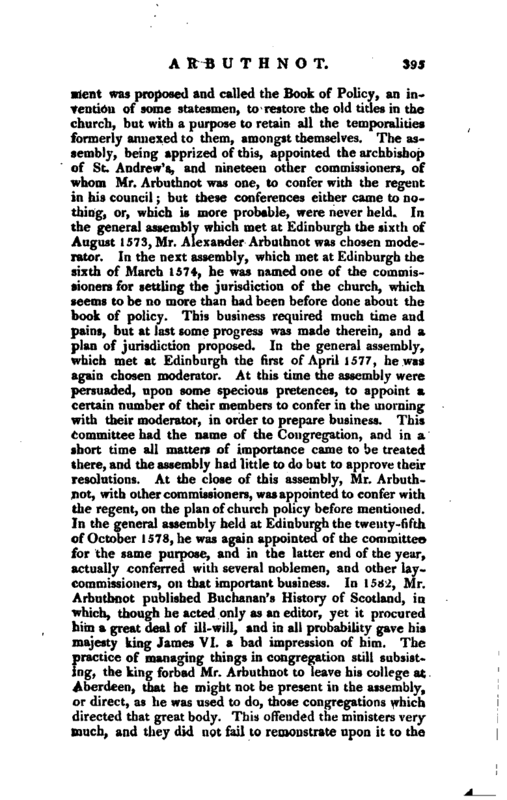 In 1568, he assisted as a member of the general assembly, which was held in the month of July at Edinburgh. 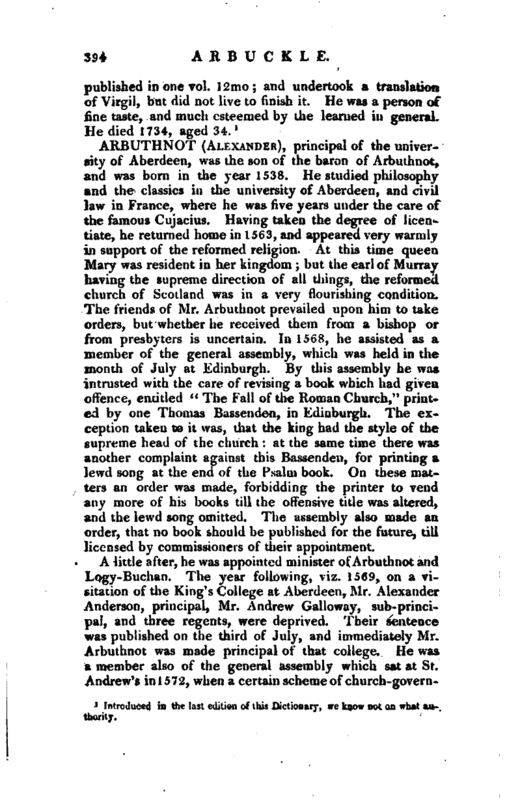 By this assembly he was intrusted with the care of revising a book which had given offence, entitled “The Fail of the Roman Church,” printed by one Thomas Bassenden, in Edinburgh. The exception taken to it was, that the king had the style of the supreme head of the church: at the s,ame time there was another complaint against this Bassenden, for printing a lewd song at the end of the Psalm book. On these matters an order was made, forbidding the printer to vend any more of his books till the offensive title was altered, and the lewd song omitted. The assembly also made an order, that no book should be published for the future, till licensed by commissioners of their appointment. 1 Biog. Britannica, Mackenzie’s Scotch Writers, vol. III. p. 186.